Reays are proud to have been named a winner at the Cumberland News Group Business Awards 2011 following a hugely successful year for the company. Managing director Chris Reay thanked staff and passengers for their incredible support over the previous 12 months which enabled us to win the Medium Business of the Year Award for Cumbrian companies with 51-250 employees. As well as launching our City Hopper public bus service in Carlisle, we ran the official transport for Radio 1's Big Weekend at Carlisle Airport, carrying nearly 20,000 fans to and from the Lady Gaga-headlined event; opened a depot and city centre travel office for customers in Carlisle. This was in addition to all the many other public and private services we are continuing to operate, including the staff transport facility at Sellafield as well as a wide range of coach and VIP limousine hire. 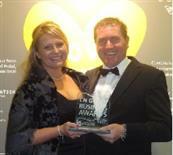 Chris and his wife Nicola, who is a fellow director, were presented with the award at a black tie dinner at Rheged near Penrith on October 20 2011. But he emphasised that it was a reward for all the hard work put in by everyone who works for Reays at our bases in Carlisle and Egremont and at our headquarters in Wigton, as well as recognition for the public's backing for the company. Chris said: "The last year has seen Reays achieve amazing growth and this would not have been possible without all the hard work of everyone who works for the company or without the incredible support we have received from the people of Cumbria who travel in our vehicles. Our thanks go out to each and every one of you."